Earnings • Diet sodas suffering because of consumer concerns about artificial sweeteners. Atlanta • Coca-Cola Co. reported sales that fell short of Wall Street estimates on Tuesday as demand weakened for Diet Coke in North America. Globally, the world&apos;s biggest beverage maker, said sales volume rose 3 percent in the second quarter  including a 2 percent increase in sodas  boosted by gains in places including China, India and the Middle East. In its flagship North American market, however, sales volume was flat despite a significant increase in marketing around the World Cup. Sodas including Coke, Fanta and Sprite saw gains, but executives said Diet Coke declined in the neighborhood of the "mid-single digits." Diet Coke is the country&apos;s No. 2 soda, behind Coke and ahead of Pepsi. Executives at Coca-Cola and PepsiCo have blamed a recent decline in diet sodas on concerns people have about artificial sweeteners such as aspartame, as well as the broader movement toward food and drinks that are seen as being natural. As such, the beverage industry has been working behind the scenes to assure dietitians and others about the safety of such sweeteners. "We do recognize we have more work to do here," CEO Muhtar Kent said on a call with analysts. Coca-Cola also plans to eventually introduce a version of its namesake drink that&apos;s naturally sweetened with stevia in the U.S. The drink, Coca-Cola Life, has already hit shelves in other markets, including Argentina. More broadly, Coca-Cola has been struggling to boost sales volume in developed markets where soda has been losing favor. To boost results, the company is cutting costs and introducing more profitable packages, like the mini-cans and smaller bottles. It&apos;s also putting greater focus on other drinks including premium bottled waters like Smartwater. But sodas still account for about three-quarters of Coca-Cola&apos;s total sales volume. For the quarter, the Atlanta-based company said profit fell to $2.6 billion, or 58 cents per share, from $2.68 billion, or 59 cents per share, in the same quarter a year earlier. Excluding one-time items, it earned 64 cents per share, which was a penny more than analysts expected. Revenue dropped 1.4 percent to $12.57 billion. Analysts expected $12.85 billion, according to Zacks. 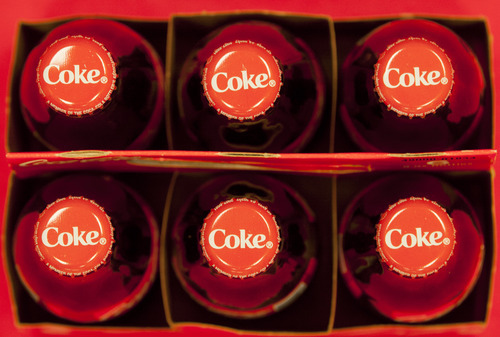 Coca-Cola&apos;s stock was down 55 cents, or 1.3 percent, at $41.85. Its shares have risen $1.09, or 2.6 percent, to $42.40 since the beginning of the year, while the Standard & Poor&apos;s 500 index has increased 6.8 percent.